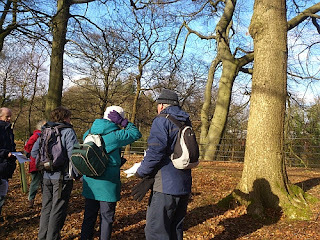 On Saturday I went out with the Glasgow Group of the Scottish Wildlife Trust to learn how to identify trees in winter. Identifying trees in summer when they have all their leaves is fairly straightforward, but in winter it is much harder. Dawsholm Park is in the Maryhill district of Glasgow City. I took the train from Glasgow Queen Street to Kelvindale station and it was only a short walk to the meeting point on Dawsholm Road. The outward journey was excellent, as I was able to travel first class on a standard ticket. The train had originally been used on the Inverness to Elgin line and the first class facilities were for passengers on that route. The extra facilities included small covers on the head rests and power points. Arriving at Kelvindale station, I was walking to the meeting point when the walk organiser, Elspeth, stopped and gave me a lift to meeting point. The day had started cloudy, but soon the sun came out and the rest of the day was nice and sunny. 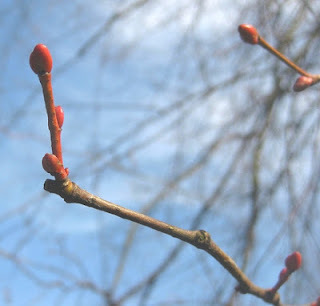 At the start of the walk, Elspeth explained that tree buds can have different characteristics and things to look out for are how buds are arranged on stems - are they in pairs, alternate or whorled? The colour of the buds is also important, as is the leaf scars and colour of the tree bark. 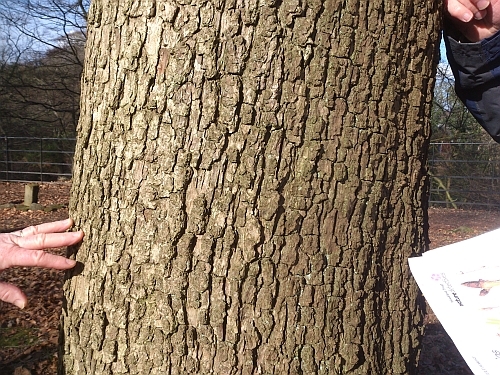 The first tree we examined was an ash tree. The ash tree has buds arranged in pairs with pointed ends. 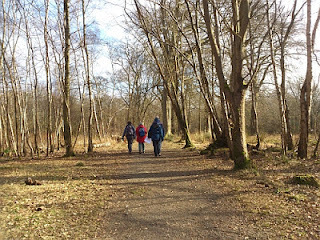 The branches also curve upwards and Ruth, who was also on the walk, said it was like a Kathy Kirby curve. Kathy Kirby was an English singer in the 1960's who had curled ends on her hair. The small white raised dots on the branches are called lenticels. Not all tree varieties have lenticles.The lenticles can be seen on the photograph above. 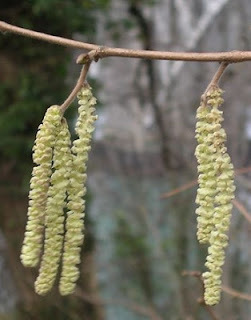 Next was a Hazel tree which had male catkins in bloom. It was explained that catkins were male while the flowers were female. The catkins looked very elegant, but unfortunately are short-lived. 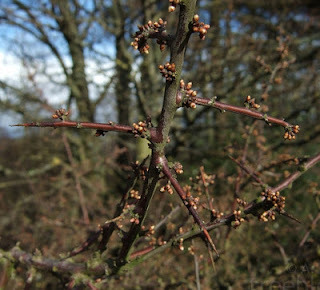 Hazel buds are alternately arranged and are small ovoid buds. As the name suggests, hawthorn branches have both buds and thorns. The buds grow alternately and there are thorns along the branches and at the ends. On the tree we examined, there were a few berries. 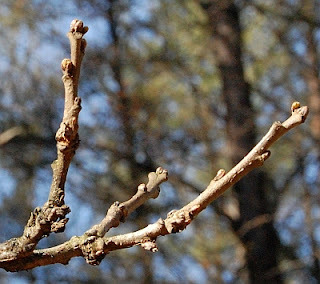 Oak buds grow alternately and the light brown buds are are pointed and bunched at the tips. Oak wood is very strong and the trees are resistant to diseases because of the high tannin content. 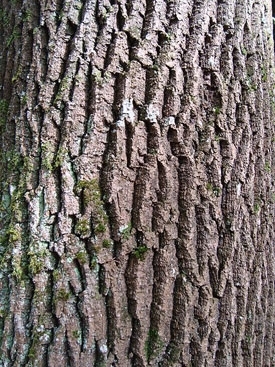 The bark also has very appealing grain markings. Oak trees are very distinctive when they have leaves in the summer months. 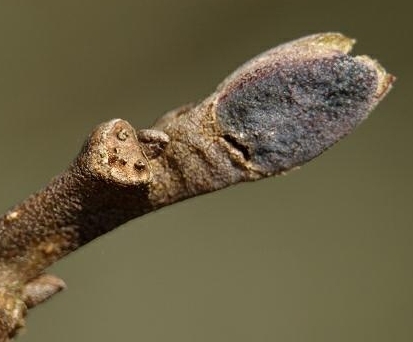 The buds of the Common Alder are generally mauve and grow alternately. 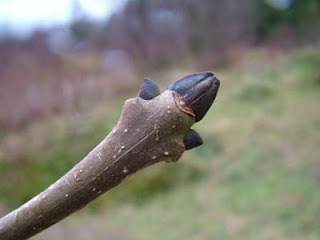 The buds are club shaped and stalked. 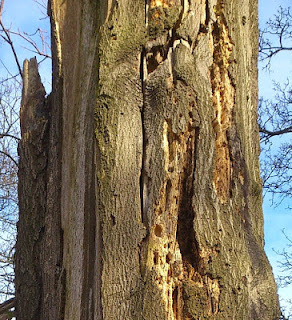 Alder timber is very resistant to decay under water and was therefore used for water pipes, pumps, troughs, small boats and piles under bridges and houses. Much of Venice is built on alder piles. 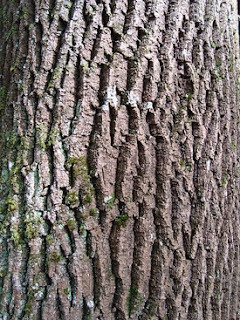 Alder wood is also used for charcoal and making clogs as it is light and absorbed shocks well. The beech buds are a Copper/grey colour, cigar shaped and up to 2cm long. They have a distinctive criss-cross pattern. They are an attractive looking bud. 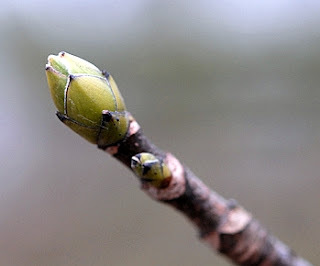 Lime buds are a deep red colour on a light green stem and grow alternately, rather than in pairs. The wood is used in wood carving or turning. The buds are large light green buds which may be clustered at the end of a twig. All maples have five lobed leaves. 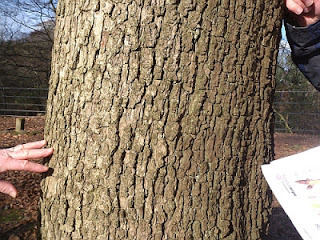 The Sycamore has many large coarse rounded teeth/serrations on each lobe. The leaf stems are red. The Sycamore it was probably introduced to provide shade from the sun. The wood is as strong as oak but does not last as long. The wood is used for making toys or kitchen items as it is easily dyed and lacks a sticky resin. 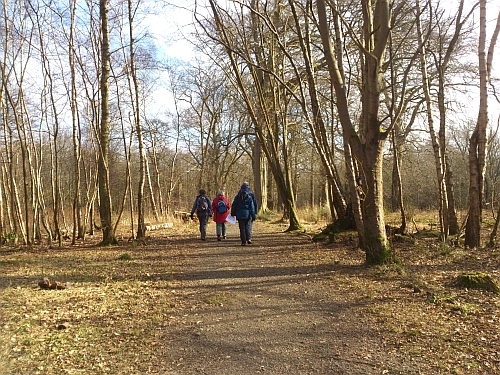 During the walk we heard a Woodpecker drumming and saw it perched briefly on a tree. A Mistle thrush, and a Buzzard were also seen. On a dead tree, the results of Woodpecker drumming could be seen. Wych elm - this was an immature tree. The walk was very informative and Elspeth, the organiser, was able to teach the group many new things about winter trees. This has encouraged me to study winter trees further in order to learn more about them. 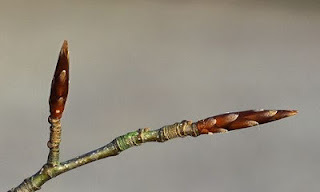 One thing to take on a walk like this is a small magnifying glass so that the buds can be examined further. I took a Ruper 10x/20x dual folding hand loupe. These are good quality lenses. Avoid the cheap ones as they distort images at the ends.